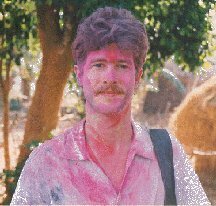 Thirteen years ago, I traveled to India for the first time. My goal was to spend the year studying Bengali language and literature at Visva-Bharati University in Santiniketan, the home of Rabindranath Tagore's great educational experiment and his beloved 'abode of peace.' At the same time, I hoped to explore the origins and continuing legacy of Tagore's revolutionary ideal of a forest ashram-school. In the back of my mind was the hope that all of this would prepare me to write a doctoral dissertation on Tagore. Things didn't exactly work out that way - although they certainly worked out exceedingly well. 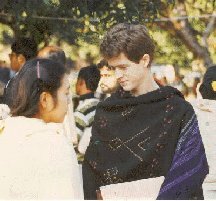 I did make it to Santiniketan all right, and I did spend the year enrolled as what the university cheerfully designated a 'foreign casual student.' I had a wonderful teacher, Professor Somendranath Bandyopadhyay, and in keeping with Tagore's cosmopolitan vision, my classmates were from Poland, Russia, and Japan. I gloried in the round of the seasons, and celebrated all the festivals associated with Santiniketan; I even had the opportunity to read a passage of Tagore in Bengali at the Convocation of the Patha Bhavan - an event that prompted more than a few smiles among the Santiniketan students. And, in keeping with my original interest in the place, I eventually published a short essay on the evolution of Tagore's ashram-university. But my experiences in Santiniketan - and in the state of West Bengal more generally - very soon transformed my scholarly interest in Tagore into a kind of anxious awe. I had revered Tagore since I had first encountered him in translation many years before. But now I was encountering him anew. I was reading his Bengali writings; I was coming to appreciate his place in the history of modern Bengali literature; and I was being brought face to face with his absolute hold over the Bengali imagination. Quite frankly, all these discoveries left me reeling. Of course, this sort of thing was bound to happen, given the fact that I was living and studying in a place that - alongside Calcutta and the rivers of east Bengal - was intimately associated with the life and work of Tagore. But on top of this, the year I arrived in West Bengal (that is, 1986) turned out to be the 125th anniversary of Tagore's birth. Now I mean to tell you, if the legacy of Tagore is typically never far from view in Bengal, during 1986 it was absolutely ubiquitous and apparently all consuming. Scarcely a day went by that the papers didn't feature some story about him, or a new poster didn't go up announcing yet another performance of his music, staging of one of his dramas, or recitation of his poetry. And of course the state government did its part to cultivate the on-going memory of Tagore, even sponsoring what it called the Rabindra Path Parikrama - a sort of walking 'pilgrimage' from Calcutta to Santiniketan. Indeed, it was hard to escape Tagore that year. It got to the point that by the time I was preparing to leave India the following spring, I noted in my journal that I couldn't bear to see another wall calendar adorned with the image of Rabindranath. I'm sorry, but I felt overwhelmed. Now I don't mention any of this to cast aspersions on Tagore. Far from it. What I want to highlight, though, is the impact all this intensive adulation had on the young scholar who had come to India with half a plan to specialize on the life and work of Tagore. In a word, it was downright intimidating. Tagore, as Amartya Sen has noted, is a 'towering figure' in Bengal (1). To tackle him, it is as if one has to take on all of modern Bengali culture - language, arts, history, politics, you name it. I can understand if this seems to some of you like hyperbole. But if it is, it ain't by much! Just how does one communicate to a non-Bengali or someone new to Tagore the breadth of his accomplishments? The best I can think of off-hand might be to visit the stacks in the library here at the University of Illinois. Look up Tagore's collected Bengali writings, known as Rabindra-racanavali, and go stand in front of them. 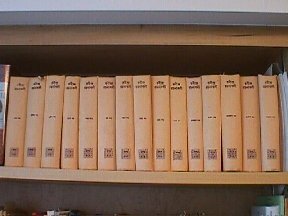 You'll get an idea of what I'm talking about: The edition I have at home runs to fifteen volumes in pretty small print. Now just imagine you're somewhere in the middle of your first year of learning Bengali. And you thought you might like to write a dissertation on Tagore. Can you feel your resolve weakening? Well, I certainly could! (And I haven't even mentioned the impressive body of work Tagore produced as a painter!). Well, it's not entirely accurate to say my resolve had weakened. More accurately, my on-going study of social and religious change in nineteenth-century Bengal led me to think that in order to fully appreciate anything about Tagore - his style as an author, his social vision, or his religious attitudes - one needed to come to terms with the profound developments taking place in all these areas prior to his advent. Couple this realization with my increasing curiosity about one of Tagore's great forebears, Isvaracandra Vidyasagar - a man Tagore called 'the first true artist of the Bengali language' - and you get a better explanation of my decision not to write a dissertation on Tagore (2). 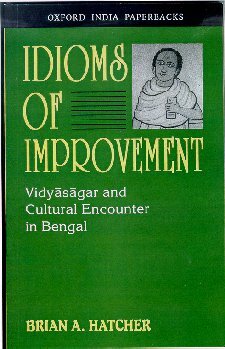 If anything, my dissertation on Vidyasagar, and the book that grew out of it ( Idioms of Improvement, Calcutta, 1996), became what you might call a prolegomena to understanding Rabindranath Tagore. For that reason, I have always felt that I have yet to return to my study of Tagore in earnest. I am grateful for this opportunity today to take a step back in that direction. Well this has turned into something of a long preamble, but I hope it helps both to indicate something about my genesis as a scholar of modern Bengal and to suggest to you how the invitation to speak here today sent me back over nearly a decade and a half to reflect upon the nature of my relationship to Tagore. And that process, of course, meant that I had to look back even further, across the span of this century, to look for the poet in his own time and place. In making that movement backward through time, I began to feel myself engaging the vision of the poet himself, who back in 1896 at the age of 35, wrote a poem entitled 'The Bengali Year 1400' (a date corresponding to 1993 AD). The poem opens with the words that frame the title of my talk today: Aji hote satabarsha pare. Aji hote satabarsha pare. (3). vanished flowers of an hundred years before. spring morning, sending its glad voice across an hundred years (4). And yet prevailing over this opening tone of anxiety is the poet's deeper trust that we will most certainly be inspired by the same things that inspired him. After all, there is nothing more we need do, he says, than 'Open your doors and look abroad'. If you do - he reassures us - you will find in 'your blossoming garden' the poet's own greetings amid 'the fragrant memories of the vanished flowers of an hundred years before'. Thus in the poem from which I have drawn the title of today's talk, Tagore expresses his hope that his songs will ultimately find an echo in our own experience as we respond to the world around us. Well I'm no poet, nor am I trained in the art of poetic criticism, so I dare not venture too deeply into the analysis of Tagore's poetry. Nevertheless, as an historian I have to be struck by the question Tagore seems to pose with this poem. And here I don't mean simply the question of whether we will still be reading his work a hundred years later. That, as they say, is a no-brainer. But the question is, why do we still read him? And what does he say to us? These are significant questions, worth trying to answer. One place to begin is to ask what it is we share with Tagore. On the face of it, this is bound to give us some pause, since for those of us who are not Bengalis there seems to be a world of difference between us - language, culture, religion. Just look again at the poem we've been considering. I've already alluded to how much seems to fall out of the original in Tagore's translation. Sure, we all know the old adage that to translate is to betray, but isn't it striking to watch the poet, as he must betray himself in order to communicate with others? And just what are we missing? You might say, not all that much. Well all right, there is no birdsong in Tagore's English rendering, no bihanger gan. But, so what? It's just a routine image of springtime, right? After all, he keeps the flowers and embellishes with the 'streak of gold from yonder clouds'. That's enough, isn't it? Perhaps, but there is so much depth to language, so much allusive power, we can be sure we're missing something. Take that word for bird, bihango. On the surface, it's really just a generic word for 'bird,' not essentially different from pakhi, with the important exception that it allows Tagore another syllable to fill out his meter. But that's not really all there is to say about the matter. For one thing, Tagore's poems - indeed all his writings - are full of references to birds. Caged birds, birds who roam free through the sky; birds who take us back to the imagery of the ancient Upanishads, birds that take flight in Sanskrit poetry, and birds who carry us into the rustic spirituality of the wandering Bauls of Bengal. For another thing, that word, bihango, may not have been chosen simply for its number of syllables. As I discovered once, when attempting to translate something by another modern Bengali, this word is rich with meaning. You'll find that it actually occurs in all sorts of forms - from bihaga, bihango, bihangama right on through to the seemingly unrelated word, humo (all derived from the Sanskrit word, vihangama, 'the one who moves through the sky'). But more importantly, you'll find that this bihango plays a large role in Bengali folktales, where it is said to be a bird that possesses magical powers - indeed the power to grant wishes. That's an interesting resonance, surely, if we take this poem to express Tagore's wish that he remain connected to his readers throughout time. Well that's enough to make my point that we're missing something. It's not a point that requires a lot of elaboration. But it does give one pause when the question is what we share with Tagore. Here we see him, in one poem, having to renounce an image and a set of allusions rich with symbolic content for Bengalis, in order to offer what he thought would be a meaningful poem for English readers. (Now here I'm not going to enter into the question of whether Tagore did justice to himself as translator; there are many who think he did not, and many who have tried with varying success to offer their own translations. I leave that for you to explore.) In any case, whatever it is we share, we can see that we've got to share it across a fairly wide linguistic and cultural divide. Then, too, there is the historical divide. We sit here today more than a century after Tagore wrote the words aji hote satabarsha pare. His world is separated from ours by the end of colonial rule in India and India's first fifty years as an independent democratic nation, by the horrors of the holocaust and the collapse of the Soviet empire, by the creation of Pakistan and the struggle for Bangladesh, by the likes of Indira Gandhi and now Sonia Gandhi, not to mention L. K. Advani and Atal Vajpayee - to mention only a few major events and major players of this century that Tagore never witnessed. And this is just what we might call the world historical list, the century's highlights. But to be honest, I'm sometimes just as amazed by the small changes that take place in as little time as a single decade. I mean, I've seen Tagore's beloved Santiniketan develop out of its idyllic pastoral isolation into virtually a bedroom community for Calcutta. (When I returned to India in 1989, I found the state government had erected billboards around Calcutta that promoted Santiniketan as a tourist destination using the slogan, 'Three hours to a Poet's Dream.' 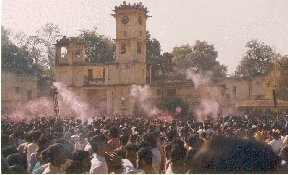 Subsequently, in 1991, the daily magazine India Today ran a short article about what we might call the suburbanization of Santiniketan entitled, 'An Idyll Invaded' (5). Likewise, we've all gone from anxiously posting letters on long, uncertain journeys to zipping emails back and forth from India. In fact, whereas in 1986 my wife and I used to feel lucky if we could tune in the BBC World Service on our short-wave radio, last summer in Calcutta I watched the entire World Cup on satellite TV. We've all seen these sorts of changes, both world historical and otherwise. But in either case, the question is, when so much has changed, what can someone like Tagore - born nearly a century and a half ago - have to say to us today? That's precisely what I'd like to consider in the remainder of my talk. There is, to begin with, a problem over the differing perceptions of Tagore in India and the rest of the world. As Amartya Sen pointed out in 1997, even though Tagore is a towering figure in Bengal he is 'not much read now in the West.' Sen went on to add, though, that it is even more interesting to puzzle over how a man whom Bengalis (and let's not forget that this includes the people of Bangladesh) view as a 'deeply relevant and many-sided contemporary thinker' is viewed in the West as a 'repetitive and remote spiritualist' (6). I don't really want to recap Sen's article for you, although I recommend it highly as a sensitive overview of the poet, written by someone who was himself educated at Santiniketan and intimately linked to Tagore through his own family history. I simply refer to it because Sen is able to demonstrate succinctly that the writer and thinker whom Bengalis admire certainly deserves a better reputation in the West. Like the Tagore of Krishna Dutta and Andrew Robinson's recent biography (Rabindranath Tagore: The Myriad Minded Man, New York, 1996), he was a 'myriad-minded' man. And as I discovered during that first trip to India years ago, he has so much to offer us, whether it be in the realm of art, religion, social theory, epistemology, or international relations. One of the reasons we must continue to look to Tagore is that he was keenly aware of the times in which he lived, of the historical importance of events around him. Obviously through his engagement with social and political issues - even when he fell out of favor for taking unfashionable positions - he attempted to contribute to his times. His on-again, off-again role in the Swadeshi agitation, his friendship with Mahatma Gandhi, his travels to Europe, Asia, and the United States (even to Champaign-Urbana! ), his vocal disgust with the kind of nationalism that spawned two world wars, and his commentary on life in Soviet Russia - all of these endeavors and more attest to his ceaseless attempt to wrestle with the changes taking place in his world. As a poet and an author, Tagore called upon others to open their eyes, to be aware of their place in history. As he put it in the poem we've already considered, 'Open your doors and look abroad.' Taken narrowly, this could be seen as no more than a poet's plea for us to notice the beauty of the world around us; but I think we need to read this line in a broader sense as well. ruddhadvare devalayer kone keno achis ore! Notice that again we hear the call, 'Open thine eyes and see' - nayan mele dekh dekhi. And while this poem seems clearly to take a jab at blind ritualism, I think we have to avoid the temptation to view it only as a piece of liberal theology. In fact, it was just such a narrow spiritualizing reading of Tagore that has left Tagore with the kind of limited reputation in the West that Amartya Sen has noted. Tagore is not just chiding people who worship in temples. Instead, he warns us all that the truth of our gods, our ideologies, our 'isms' is bound to perish if we lock them up in dark corners, if we fail to view them alongside - and in dynamic conversation with - the rest of creation. In fact, for Tagore truth is not some separately existing entity; truth is only realized by and through human beings. For an easy entree into this aspect of his thinking, look at his book, Personality, from 1917, where he rejects the view of our mind as a mirror of reality, preferring instead to speak of the mind's ceaseless work in creating our worlds (8). In any case, perhaps it's time for scholars to draw Tagore into current debates over knowledge, meaning, and truth. On a less theoretical level, I have read Tagore's poems with several classes of first-year students at Illinois Wesleyan. In discussing Tagore's impatience with what he calls 'shut-eyed habit,'(9) I often tell my students how the experience of having a child helped me open my eyes onto a world I had either never discovered or had long ago ceased to experience. I have joked with my classes that after living with a toddler, I often found myself getting excited by the sight of a piece of construction equipment or the appearance of a squirrel in the yard - oftentimes even if my son wasn't with me. Walking to work, I might pull up in delight and say to myself, 'Look, there goes a big school bus.' Thanks to my child I had re-encountered the sheer wonder of the world. The way his eyes were always open, helped me to reopen my own. Paraphrasing a line from Kshitish Roy's translation of one of Tagore's later poems, I have told my students that what we need to do is make this sort of wonder our daily ritual (10). What an idea! Make the experience of wonder a daily ritual! Here I think we see one of Tagore's strengths as a poet - he can take our understanding of a notion like ritual and turn it completely upside down; ritual, which we tend to view as the dead repetition of 'shut-eyed habit,' suddenly becomes a word designating a life lived in a state of near-constant, wide-eyed wonder. Tagore says if such wonder were indeed our daily ritual, then we could no longer associate ritual with the death of reason and imagination; instead, we'd have to view it as the wellspring from which we draw our inspiration. I suggest to you that Tagore's ability to play with language this way, and in the process to redefine the limits of our world, is yet another reason we need to keep reading him. To my mind we are treading close to the core of Tagore's vision - this theme of being ever open to ourselves, to others, and to the world. It is a deeply humanistic vision. For all that has been made of Tagore's evocation of his jiban-devata, the so-called deity of his life - that ever-present indwelling spirit that seems to owe a great deal to the antaryamin, or 'inner controller' of the Upanishads - for all that has been made of jiban-devata as a religious concept, I tend to think that it is but one means Tagore has of articulating his vision as a humanist. For Tagore, it is only through our openness to others and to the world around us that we discover who we truly are. This is how we fulfill our manuser dharma or manava-dharma, what we might call 'the religion of humanity'. Nevertheless, this emphasis on humanity, or what Tagore sometimes refers to as manava-prakrti, bears some critical reflection. For many intellectuals such talk of human nature has recently been put in jeopardy by post-structuralist thought. In contemporary philosophy and critical theory notions like human nature and the self have been proclaimed dead, dismissed as essentialist relics of Enlightenment rationality. This is but one problem we have to wrestle with when listening to Tagore today. Relatedly, can Tagore's humanist quest be reconciled with an anti-foundationalist epistemology? Can one be an anti-foundationalist humanist? Or have we perhaps reached the point where we have to conclude that Tagore really had no single consistent philosophy to offer; that we may admire him as a poet, but should beware of looking to him for any durable philosophical insights? I don't think so, and I'd like to take a minute to consider this question. In fact, this is a problem I've given some thought to recently, notably in my book, Eclecticism and Modern Hindu Discourse (New York, 1999). If I were to frame the problem as I try to in that book, I might ask: Can one be both a postmodernist intellectual like Salman Rushdie and a modernist humanist in the tradition of the great Unitarians who we remember in this building, like say William Ellery Channing, Ralph Waldo Emerson, or Theodore Parker? I guess I should say a bit more about what I mean by this. The point is, these days we associate someone like Salman Rushdie with magical adventures into a postmodern world where absolute truths and essences give way to truths that are always contingent, truths that must be truths for someone, even if those truths appear to others to rest upon shaky foundations, even if they rest on what Rushdie calls processes of 'unreliable narration' (11). By contrast, the great modernist humanist thinkers like Emerson and Parker have been preoccupied with finding real and certain truths that will provide the kind of firm and incontrovertible foundation they assumed we need if we are to achieve genuine selfhood and community. This is certainly our understanding of what is sometimes called scientific humanism. Now I think you'll see that between a Rushdie and an Emerson there appears to be a world of contrast. For one thing, postmodernists like Rushdie eschew the humanists' infatuation with the supposed autonomy of the self, preferring instead to view the self, again, as something constructed and contingent. Given such a contrast, we're bound to ask ourselves: Which vision do I prefer? Or can I possibly have it both ways? I have found one helpful approach to resolving this dilemma in the work of the philosopher Richard Rorty, who is sometimes labeled a neo-pragmatist. What appeals to me about Rorty's project is that it combines an unapologetic attempt to hold on to what he calls the modernist humanist - we might say the liberal - dream of human solidarity and community, with an equally sincere attempt to adopt a thoroughly anti-foundationalist view of truth. Much of what Rorty says turns upon our sense of irony. We need to be, he says, 'liberal ironists.' Put very simply, an ironist is someone who can step back from his or her own values so as to see things from other perspectives. Thus to be an ironist in Rorty's terms is to be someone who takes their view of the world seriously as the means for promoting human community and freeing the world of cruelty, but someone who at the same time doesn't take their view of the world so literally as to deny the possibility of there being other ways of viewing the world. In fact, at one point Rorty quotes someone (the name escapes me now) who says our goal ought to be to hold on to our truths absolutely, without making the mistake of thinking they're absolutely true. The polar opposite of the liberal ironist, in Rorty's terms, is the 'liberal metaphysician,' who claims to speak for the absolute truth about reality, who thinks there is only one correct way to speak about reality. In Rorty's terms, the choice is between viewing the world as a poet and as a metaphysician. Following the literary critic, Harold Bloom, Rorty tells us that the key to the liberal ironist's vision is poesis, which as you know is simply the Greek word for 'the act of creating'. A poet in Rorty's terms is 'the maker of new words, the shaper of new languages' (12). In this category Rorty ranks not just those we typically think of as poets - such as Homer, Shakespeare, or Yeats - but all the great thinkers who have helped us re-vision our world; people like Copernicus, Kant, Einstein, Proust, and Nietzsche. Now, since Rorty's a philosopher in the Anglo-American tradition, I can forgive him for failing to look for such poetic exemplars beyond the borders of Europe and America. But in the conclusion of my book I suggest that modern India has been blessed with any number of such poets, men like Ram Mohan Roy, Keshub Chunder Sen, Swami Vivekananda, and Mahatma Gandhi. And my point was not simply to add names to Rorty's list of great thinkers. 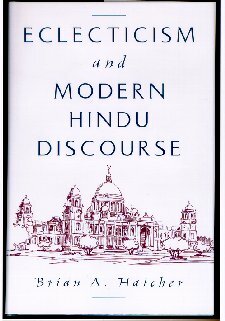 More importantly, my goal was to suggest a way to understand some of the tensions within these thinkers' own work; to grapple with, for instance, how Vivekananda's famous admonition, 'Arise, awake, and stop not till the goal is reached' could be viewed both as an obvious mistranslation of the Upanishadic phrase, uttisthata jagrata prapya varan nibodhata, and as a crucial slogan that helped fuel a reconception of Hindu life and thought (13). While the metaphysician - or in this case the Indologist - might simply write off Vivekananda's wordplay as evidence of sloppy thinking, the liberal ironist sees in Vivekananda's playful reworking of the original Sanskrit a powerful attempt to energize the Indian psyche under conditions of colonial rule. I hope by now I've said enough for you to see where I'm headed. Tagore, like Vivekananda, needs to be understood as a poet in Rorty's sense. Not because he is often called 'the poet.' No, there's more to it than that. After reading Rorty, one is led to an even deeper appreciation of what it means to call someone like Tagore a poet. You don't earn that title, in Rorty's book, just by writing poems. You earn that title when you re-describe the world, when you provide for your readers new vocabularies through which to account for the world - without yourself failing to appreciate that others may use alternative vocabularies. This is precisely what Tagore has done - and still does for us, a century later. And this is why I think we need not fear inconsistency if we find that on the one hand Tagore refuses to believe in any absolute truth that exists apart from human experience while on the other he invokes the concept of human nature or his own jiban-devata. In each case, we witness his attempts as a poet to create anew, to prompt alternative insights into our world and our experience. No doubt you've heard it said that since Tagore was a poet it's not really fair to expect from him a well-reasoned philosophy. Certainly this does a disservice to Tagore. And, ironically, after reading Rorty one comes to the realization that some of our greatest philosophers have themselves been poets! The fact that Tagore continued to grow and change intellectually and politically makes him a challenging person to read or to get an overall grasp of. One tends to resort to schemes like that used by Susobhan Sarkar, who broke Tagore's life down into a series of alternating stages of what he called orientalism and westernism. While this certainly helps us view Tagore's thought across the decades, it tends to give the impression that when you're dealing with the one Tagore, the other is missing. His scheme also required Sarkar to judge which of these two Tagores was the more 'mature'. (14) Yet, surely it's more complicated than that; surely these attitudes don't replace one another diachronically, but interweave and interpenetrate synchronically, in a complex web of attitudes. Perhaps it is precisely these ambiguities and apparent contradictions in his work that lend it its vitality and its on-going relevance. Not in the trite sense that you can find in his work an example of just about anything (which isn't true, in any case), but in the more profound sense that if you engage Tagore seriously there will come a time when he will force you to see things anew; he will ask you to open your eyes. Tagore's own constant movement as a poet may be our best evidence that he made a serious attempt to live by his own advice. If he was to keep himself open, he had to be open to viewing his world in ever-new ways. Naturally, it is this very openness that has caused him to suffer at the hands of critics. I have already mentioned his ambivalence about the Swadeshi campaign - how he was at once both the coiner of slogans and the voice of doubt. But if his openness has produced ambiguity, if we find his philosophy occasionally at war with itself, perhaps we should be grateful. As one commentator has noted, it may be precisely in his occasional 'bewilderment, bafflement and incomprehension' that Tagore comes closest to us (15). Now I have to pause just a moment before concluding and say that you may certainly be forgiven if you're new to Tagore and you find much of what I've said somewhat overblown in light of the initial poem from which I drew the title of my talk. I admit, if I were to go back to 'aji hote satabarsha pare,' those don't necessarily sound like words that re-defined the world. But let's remember, that's a single poem, which was principally chosen for the way it asks us to account for our response to Tagore a century later. But I assure you, if you want more resounding confirmation of what I'm saying, you needn't look far. Even a skilled translator like Radice discovered his limits in Tagore's last collection of poetry, Ses lekha ('Last Writings'), from 1941. As Radice writes, 'I do not know Tagore well enough . . . [to] provide the commentary that would be required, the long history in his life and experience of every thought and line of its fifteen short poems' (17). Lord knows, I can sympathize with that sentiment! Nor does Ses lekha mark the end of the challenges Tagore left for us. In that same year (1941) Tagore delivered, in an address at Santiniketan, a stinging indictment of western civilization, entitled Sabhyatar Sankat, or 'Crisis in Civilization'. Here at the very end of his life he spoke despairingly of humanity's lost heritage, symbolized in part by what he called the 'mud and filth' generated by the British empire in India. 'And yet,' Tagore simultaneously proclaimed, 'I shall not commit the grievous sin of losing faith in Man.' Once again we encounter the challenging ambiguity: humanity is dead, long live humanity! This world, says Tagore, is no dream. It is real; or better still, it becomes real when we engage with it. 1 See his essay 'Tagore and his India' in the New York Review of Books (June 26, 1997). 2 The phrase is taken from Tagore's Vidyasagar-carit, in Rabindra-racanavali, vol. 2, pp. 767-88. 3 From his poem 1400 Sal which originally appeared in Tagore's 1896 collection, Citra (see Rabindra-racanavali, vol. 2, pp. 198-99). 4 Quoting from Tagore's own English translation of the poem as it appeared in The Gardener; reprinted in The Collected Poems and Plays of Rabindranath Tagore (New York, 1966), p. 118. 5 See India Today (Nov. 15, 1991). 7 The original is from Tagore's collection Gitanjali, no. 119, in Rabindra-racanavali, vol. 6, pp. 79-80. The translation is Tagore's own from Gitanjali (New York, 1978), pp. 30-31. 8 Personality (London, 1917), esp. p. 47. 9 See the poem 'Scattered in this Room' in A Tagore Reader, edited by Amiya Chakrabarty (Boston, 1961), pp. 357-58. 10 See the poem 'Shunned at the Temple Gates' in A Tagore Reader, pp. 369-7= 1. 11 See Salman Rushdie, Imaginary Homelands: Essays and Criticism 1981-1991 (New York, 1991), p. 25. 12 Richard Rorty, Contingency, Irony, and Solidarity (New York, 1989), p. 20. 13 Katha Upanishad 3.14, which is rendered by R. E. Hume as, 'Arise ye!/Awake ye!/Obtain your boons and understand them!' See his Thirteen Principal Upanishads (New York, 1931), p. 353. 14 See his essay 'Rabindranath Tagore and the Renaissance in Bengal' in his collection, The Bengal Renaissance and Other Essays (New Delhi, 1970). 15 William Radice, Rabindranath Tagore: Selected Poems (New York, 1985), p. 34. 16 The original is Janmadine, in Rabindra-racanavali, vol. 13, pp. 75-76. The translation is from Radice, Rabindranath Tagore: Selected Poems, p. 125, 1994. 17 Radice, Rabindranath Tagore: Selected Poems, p. 34. 18 'Rupnarayaner kule', Ses lekha, 11, in Rabindra-racanavali, vol. 13, p. 122. 19 See Chirayatri in Shyamali (Rabindra-racanavali, vol. 10, pp. 150-52). The poem has been translated as "The Eternal Traveller" by Aurobindo Bose, whose rendering I follow. 20 The first line of his poem Ek gaaye from the collection, Ksanika, in Rabindra-racanavali, vol. 4, pp. 220-21.